Small - €66.99 Medium - €66.99 Large - €66.99 Only 6 left! Isis, the great goddess of Egypt, bringing her blessings and wisdom to all peoples, from the wealthy to the downtrodden. Isis was married to her brother Osiris (yes, a bit weird, but that's how the old gods and goddesses did things), and after he was murdered by Set, she wept, causing the Nile river to flood each year. Fortunately, she was able to bring Osiris back to life, because she's a freaking goddess and can basically do anything she wants. Isis is the great protector against evil, and will most definitely drop the hammer when needed. She could crush the Egyptian pyramids in a single blow. Best not to cross a woman of such power. Sound familiar? Of course, it does, because you're a woman of incredible power too! Sure, you may not have power over death, or the ability to fight other gods, and you're not married to your brother, but you are incredibly powerful! And just look at those wings! You spread those wings and people will most certainly know you mean business. But not just any business, because even when showing off your power you're still looking great, and those colorful wings are no exception. Isis might as well be the goddess of being exotic given how awesome she looks. Can you imagine showing up to a fancy gala in this outfit? Jaws would drop. People would start drooling in awe, so lucky to be in your presence. 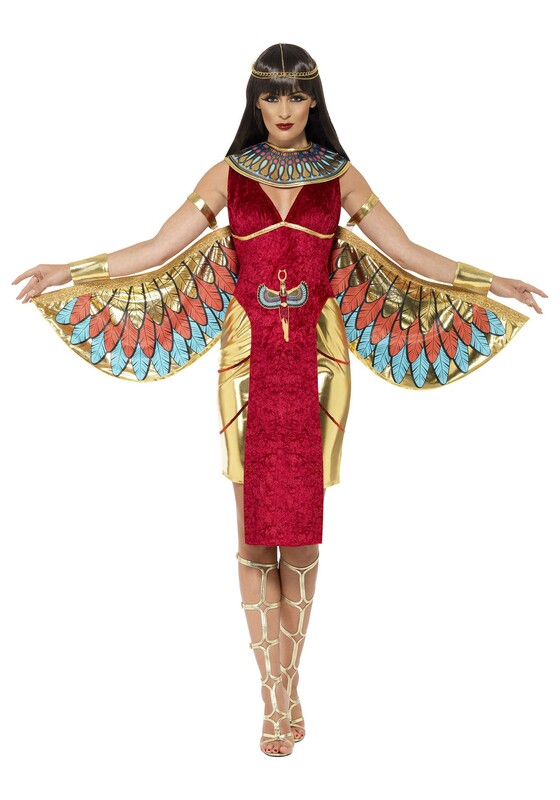 This isn't an outfit for the meek with a deep red dress and colorful Egyptian collar. This outfit is for powerful women, ready to take charge. Spread those wings, girl. You've got some pyramids to crush.